Uncertainty cultivates one of today's key drivers of success: serendipity. 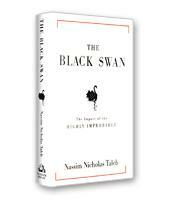 More than blind luck, serendipity can produce quantifiable results: breakthrough ideas, relationships that matter, effortless cooperation, synchronized market timing, and more. 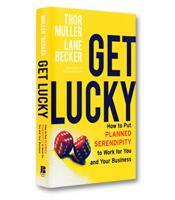 Get Lucky shows businesses how to succeed by fostering the conditions for serendipity to occur early and often. 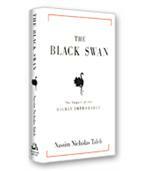 Whether or not an apple truly fell on Sir Isaac Newton’s head to inspire the theory of gravity, there are many examples of real companies and real people whose inventions and creations were inspired by luck, as Internet entrepreneurs Thor Muller and Lane Becker write in their book, Get Lucky. After all, didn’t 3M invent the Post-it because one of its employees had trouble keeping his place in his hymnal? Well, not quite, explain the authors. The road to the Post-it involved three factors: a 3M scientist allowed to work on his own and give in-house speeches about his discovery, a 3M inventor who attended one of the speeches because he was tasked with finding new product ideas, and several false starts. A failed adhesive was incorporated into a scientist’s creation of a peelable bookmark. The bookmarks were so unpopular they piled up on the inventor’s desk. One day he needed to make a note to his boss. He reached for a leftover bookmark and the rest is history. In short, 3M actually created the conditions that allowed "luck" to occur. The goal of their book, the authors write, is to help companies "plan to get lucky" in the same way that 3M and other companies have been able to do consistently. The authors call this approach "planned serendipity." 1. Motion. The lucky keep moving. Animation studio Pixar’s headquarters is designed so that the main services employees will need at different times of the day (cafeteria, staff mailboxes, etc.) are in the atrium, forcing everyone to keep moving to the center of the building (where chance meetings spark serendipity). 2. Preparation. Create room for serendipity in your mind. This requires curiosity, noticing exceptions (when something is not happening the way it should) and forgetting what you know to be true. 3. Divergence. Follow a new path that unexpectedly emerges from a chance event. A premium wooden door manufacturer uses a proprietary woodworking process that creates beautiful doors — and piles of wasted wood. Then one day, the daughter of one of the founders asks for a fancy skateboard... and the premium door entrepreneurs realize they have a new (and lucrative) business. 4. Commitment. There are many options; pick one on which to focus. The best organizations that never stray from their core purpose are the ones that run into opportunities. 5. Activation. Activation initiatives must help people generate, notice and respond to serendipitous occurrences. One way is to help make them aware of peripheral events. At CNN headquarters, for example, the ongoing newsfeed is visible in every room. 6. Connection. Optimize the number and quality of connections. CERN, the European Organization for Nuclear Research and the birthplace of the World Wide Web, is the professional home to 10,000 scientists scattered around the globe. CERN’s Technology Transfer Office ensures that its hundreds of labs stay connected to each other and the outside world. 7. Permeability. Tear down the walls, not only between employees and functions, but also between your business and customers. The best businesses today recognize that knowledge can flow in as well as out. 8. Attraction. Attraction is basically the ability to combine all the serendipity skills outlined above. The bottom line of Get Lucky is that, as the authors write, "luck is hard work." With this manual on how to get lucky as a guide, however, readers will find that the hard work can pay off.